AutoAlliance Thailand (AAT) is the name of a joint venture automobile assembly firm co-owned by Ford Motor Company and Mazda Motor Corporation in Rayong province, Thailand. Modeled after the Ford-Mazda AutoAlliance International joint venture in the United States, AAT builds compact pickup trucks and SUVs primarily for the South-East Asian market, with exports to other developing markets, and Europe as well. The factory in Thailand is designed to be similar to Mazda's Hofu plant, and is arranged as four squares. Ford's sales in Thailand began in 1913 with the Model T, but it was only in 1961 that Ford began construction there. Anglo-Thai Motors Company, Ford’s distributor (which sold Ford of Europe and Ford of Australia products), announced in 1960 that it would build a factory in the country, with Thai Motor Company the result. This was the first time automobiles had been built in Thailand - Ford Cortinas were assembled locally using components shipped in from the UK. Mazda first began exporting utility vehicles to Thailand in 1950. In 1974 Sukosol & Mazda Motor Industry was founded, opening Mazda's first knock-down assembly plant in 1975. Ford brought Thai Motor under the corporate umbrella in 1973, but closed the factory just three years later. Company presence returned in 1985 with the formation of New Era Company to push cars and trucks in the country. Construction on the new AutoAlliance plant began on November 28, 1995, and the plant began mass production on May 29, 1998. The grand opening ceremony on July 1, 1998, included Chuan Leekpai, the then-prime minister of Thailand. 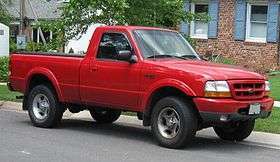 1998-00 model year Ford Ranger. ↑ "Highlights of Ford Thailand". Ford Motor Company Newsroom. Media.ford.com. 1998-07-01. Archived from the original on 2012-03-20. Retrieved 2012-05-29. 1 2 3 "Facilities | Ford Motor Company Newsroom". Media.ford.com. Archived from the original on 2012-06-17. Retrieved 2012-05-29. ↑ "Ford Fiesta Marks Latest Global Milestone With Start Of Production At State-Of-The-Art Facility In China". Media.ford.com. 2009-01-15. Retrieved 2012-05-29. ↑ Tabamo Dinzo (2013-03-25). "Ford Presents EcoSport at Bangkok Motor Show, Is Mum on Pricing". Top Gear Philippines. Retrieved 2013-06-14.